Did you see yesterday’s announcement that I am now a “Chief Waffle Officer” for Eggo? Yep, I’ll be sharing a creative kid-friendly Eggo recipe each day this week. And if you’re like to “play along,” you can make a fun recipe with Eggo products, too, to enter into The Great Waffle Off on the Eggo Facebook Page. (You could win $5,000 or a year’s supply of Eggo products!) Yesterday I shared a yummy Cinnamon Waffle Snack Mix. Are you ready for some more Eggo fun today? How about some early learning fun? Prepare the mini pancakes is the microwave following the package directions. 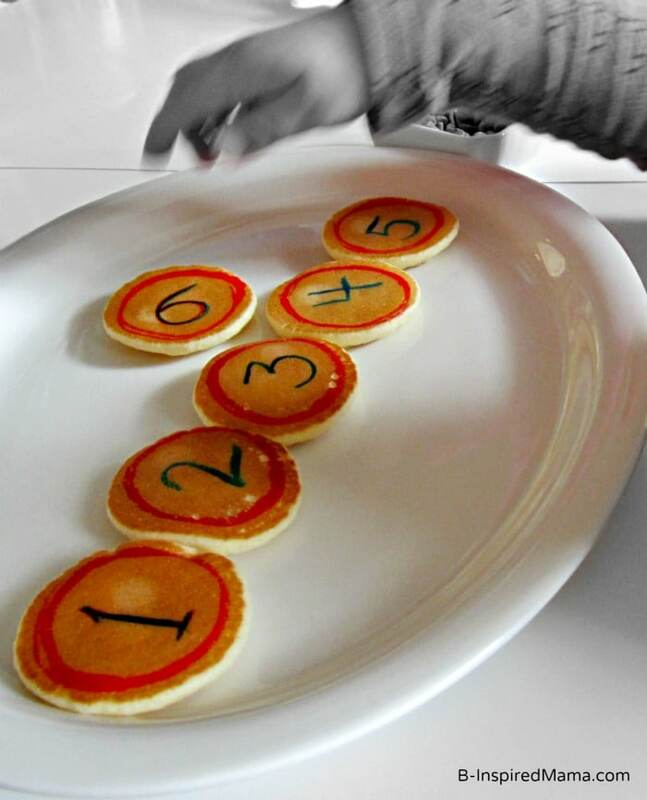 Use the food coloring markers to write a different number (we did 1 through 6) on each pancake. 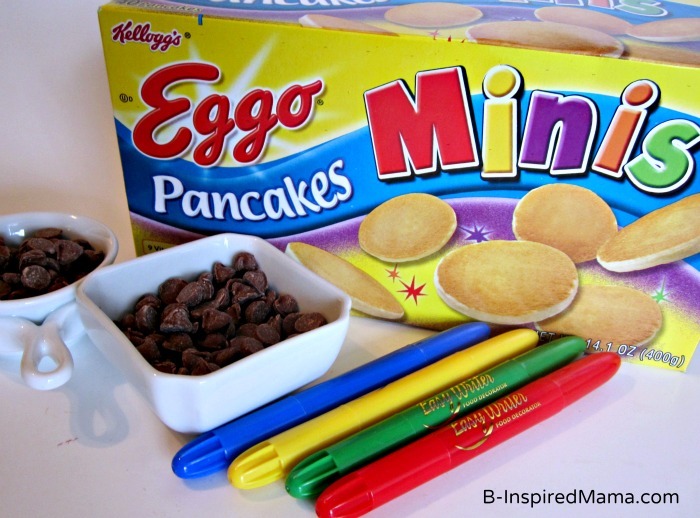 Use the food coloring markers to write the letters of your child’s name on each pancake. Make sure they’ve cooled to the touch before allowing your child to play and learn with them. 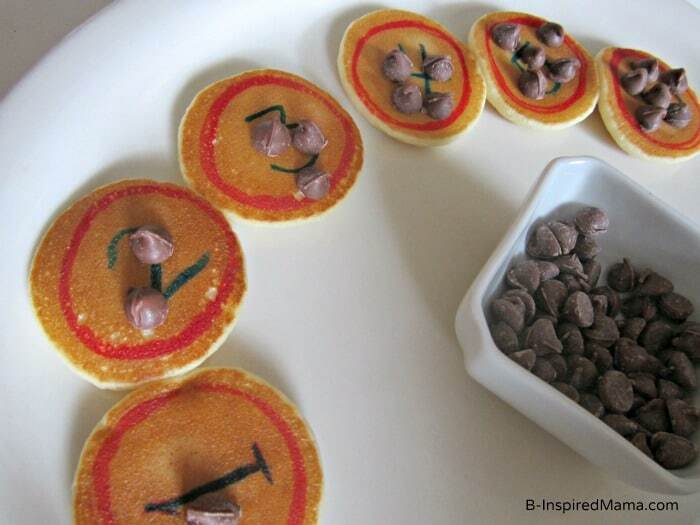 Give your child a plate with the number pancakes in no particular order and have them put the number pancakes in order. Have your child stack the number pancakes from the highest number to the lowest or lowest to highest. Have your child put the correct number of chocolate chips on each number pancake. 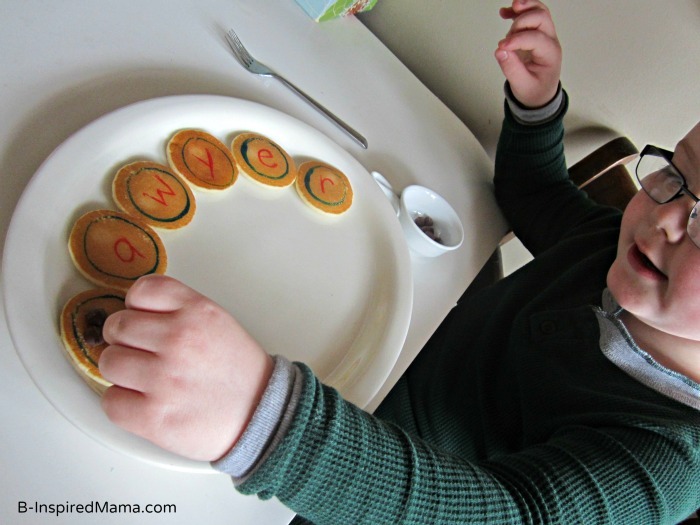 Give your child a plate with the letter pancakes in no particular order and have them put them in order to spell their name. Call out a letter or number and have your child put a chocolate chip on the correct pancake. Call out a certain letter or number for your child to eat! YUM! 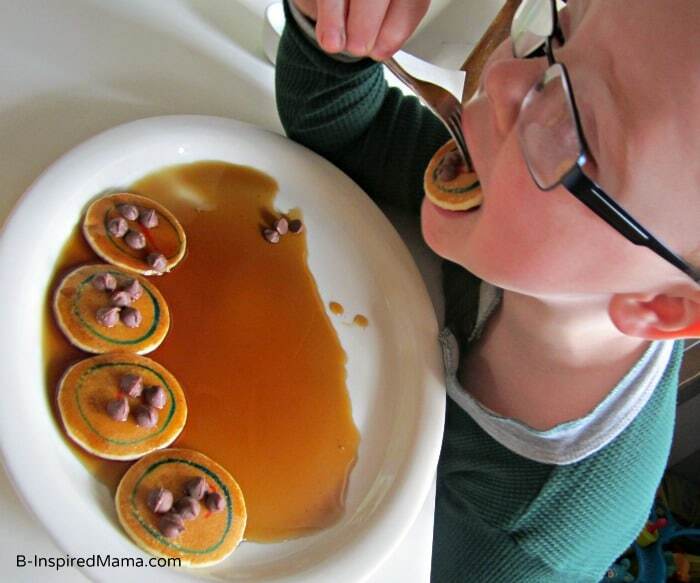 Have you ever used food for Early Learning fun? I love to link up with: Contest Corner, Made by Me Monday, Just Something I Whipped Up, Made by Little Hands Monday, Tasty Tuesdays, Frugal & Fabulous Giveaways, Tuesday Tots, Tip Me Tuesday, Get Your Craft on Tuesday, Made by Me Wednesday, Kids Get Crafty Wednesday, The Mommy Club Wednesdays, Your Creative Timeout, Artsy Corner Thursday, It’s Playtime Thursday, Thursday Giveaway Linky, The Weekly Kids Co-op, Read Explore Learn Friday, For the Kids Friday, Kitchen Fun and Craft Friday, Bonggamom’s Friday Finds, Freebie Friday, Pin It Friday, Show & Share Saturday, Share it Saturday, Super Saturday Giveaway Link-up, The Sunday Showcase, The Sunday Parenting Party, Around the Blogosphere, Afterschool Express, and Link & Learn Sunday. 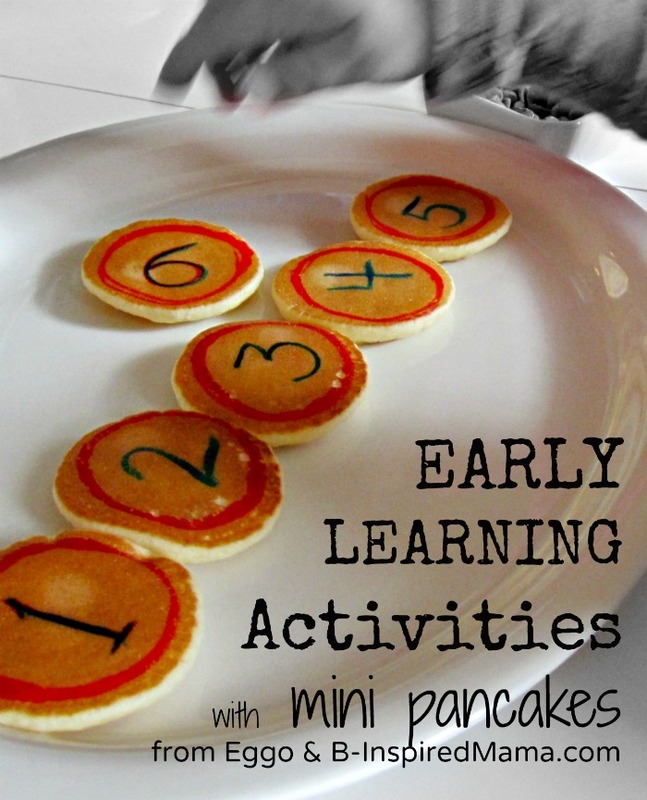 What a fun idea for adding learning to eating breakfast!! We will have to try this ourselves!! Thanks for sharing. You’re welcome! Let me know how it goes if you try it.